This product requires the base game Europa Universalis III Chronicles. 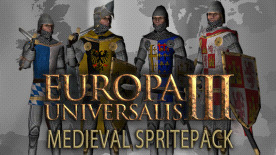 This spritepack includes 16 new sprites for the Western Europeans in the 15th century of Europa Universalis III. Sixteen historically authentic modeled western European units with new animations, for a more realistic and more beautiful game atmosphere. Units are equipped with swords, shields, daggers, armors, chain mails, jerkins, capes, basinets and pig face basinets. Europa Universalis III is required to play this DLC.